Turritopsis dohrnii just won’t quit. The aptly named Immortal Jellyfish is the only creature in the world that can revert back to its juvenile form after reaching sexual maturity. How, you ask? The process is called transdifferentiation, whereby one type of cell is transformed into another type of cell. 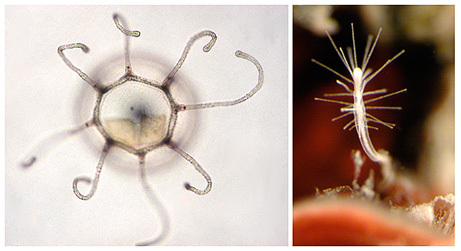 The Immortal Jellyfish can do this with its entire body. 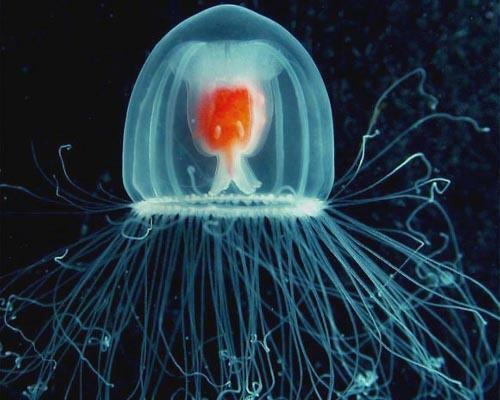 The adult Immortal Jellyfish looks and floats like…a jellyfish. But when conditions aren’t ideal, it turns into a “blob-like cyst”, anchors to a surface and undergoes reverse metamorphosis back to its juvenile form as a mere polyp. It’s like a full-grown frog turning back into a lowly tadpole. Scientists believe it can repeat its life cycle indefinitely. Since they’re constantly cheating death, the Immortal Jellyfish are now spreading from their native Caribbean to waters all over the world. THIS IS THE CREAPYIST THING EVER! TROLOLOLOLOLOLOLOLOLOLOLOLOLOLOLOLOL!